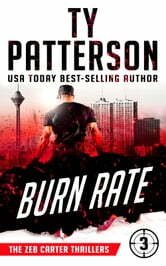 When an assassin burns innocents in New York, Zeb Carter knows they aren't the acts of a random killer. That close to the biggest event in the city, the G20 Summit, they are the signs of a terrorist planning to bring down the world order. The mastermind behind the terrorist is an old enemy, one who wants to bring the United States to its knees. And when Zeb uncovers his identity, it is war. Him against the world's deadliest spymaster. To win it, he will have to start a fire himself. Love all the Zeb Carter books this one just as much a page turner. Can’t wait for the next one.